Google Webmasters just displayed the release of a new algorithm update change, which now can be seen in Webmasters for 07-29-2016. The update is not “actually” an algorithm change, but more correctly can be identified as an erroneous labeling for device categories. As far as we can determine no updates or changes were actually made, but they notated the issue in Webmasters Search Console. If this doesn’t wet your appetite, take a gander at Google’s Search Console support documentation after which begins with a brand new proactive way of managing your site’s presence in Google search outcomes. Also, it should be noted that any delays you have seen or experienced could be a result of this glitch. 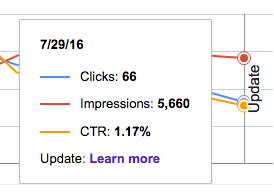 If you noticed in search console lately it has been lagging behind a few days. If you’re wondering why, this was what is going on – here is your answer to what changed.